A Rorschach Test is a psychological test in which participants view images of abstract inkblots. Participants then explain what they see, often constructing stories about the images. It is a projective test because many mental health practitioners believe that test subjects project feelings onto the test. The test is named for its creator, Hermann Rorschach. Rorschach developed the test in the early 20th century, and the test became increasingly popular in the middle of the century. By the 1960s, it was commonly given to patients in psychiatric hospitals. The test has waned in popularity in recent years and has largely been replaced by generalized personality tests and DSM diagnostic criteria. However, some mental health practitioners still use the test as a supplement to other forms of testing. The official test uses ten symmetrical inkblots. However, online tests are available that may use different numbers of inkblots. 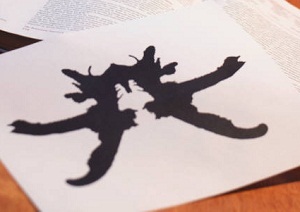 The tester presents the subject with each inkblot and asks him or her to explain the image. After the subject has seen all of the cards, the tester presents them again and asks the subject if he/she still sees what he/she originally saw. The tester may take notes during the procedure. Test results may be coded using algorithms providing information about common answers and their meanings. Some testers, however, may use psychoanalytic techniques to interpret results. For example, a person who sees an angry monster in each photo might be interpreted as someone who is suffering from repressed anger, a person who feels fearful, or a person with repressed memories of trauma. Because interpretation is subjective (even when test results are coded, codes cannot account for every possible answer), different testers may interpret results differently.